WANGZ Hotel is conveniently situated in the charming Tiong Bahru area of Singapore, distinguished for its eclectic blend of Art Deco and Straits Settlement style. Its prime location offers easy access to the sunny city-state’s most popular sights and world-famous attractions. This forty-one room boutique hotel is an urban sculpture of gleaming aluminum cladding, designed with large, asymmetrically-placed windows. The hotel houses a private collection of original commissioned artwork that blend seamlessly with its richly detailed, contemporary hip-meets-classic décor. We stayed in a Superior Room that had a king-size Sealy Posturepedic bed, sumptuous cotton linens with a goose feather down duvet and pillow menu. Luxurious bathroom comforts included a rain shower with a view of the city, piped-in mood music, plush bathrobes, and upscale made-in-England Molton Brown, London bath amenities. Complimentary internet access was provided in our room, along with a 37-inch flatscreen TV with a DVD player, universal power outlets, and an iPod docking station where we could easily charge our iPhone. Tea and coffee making facilities were offered and we were also treated to complimentary selected beverages (soft drinks, juices, bottled water) from the mini-bar as well as breakfast in the morning. Two food & beverage options are offered at Wangz Hotel: Nectar & Halo. 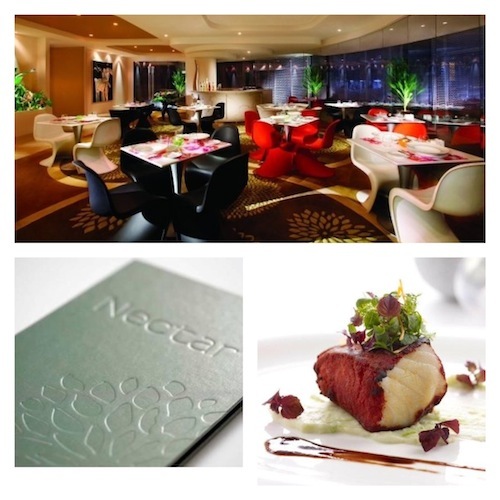 Nectar Restaurant (click here) serves a selection of modern cuisine with Asian influences, and Halo Lounge (click here) is the hotel’s rooftop lounge, where you can marvel in panoramic views of the Singapore skyline, while sipping a martini in a fantastic atmosphere. Don’t miss Halo’s live acoustic music performances on Friday and Saturday evenings. 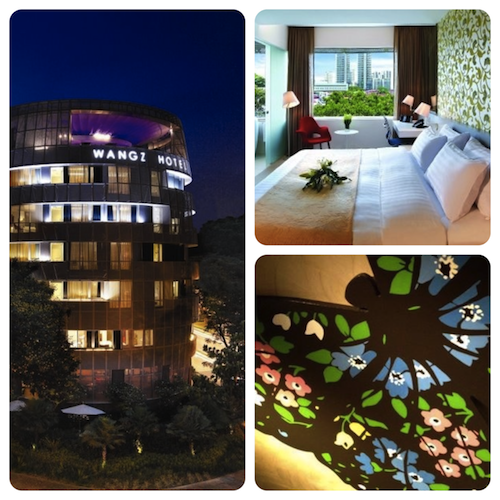 Many thanks to Zhiling Wang and the WANGZ Hotel team for our wonderful stay!